1 silk is removed and is made to vanish! 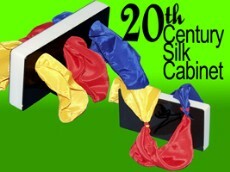 When the 2 remaing silks are pulled from the cabinet, the VANISHED silk appears tied BETWEEN them! ��������� All Silks are INCLUDED!